Supersoft, premium stretch denim. Black wash with fading and whiskering. Button closure, zip fly. Elastic insert above curved front pockets. Five-pocket styling. Wash before wear. Color may transfer when new. Choose your maternity size based on your pre-pregnancy size. Inset panels sit under your belly. Slim through the hip and thigh. Skinny leg opening. Inseam: regular 29"/74 cm, tall 31"/79 cm. 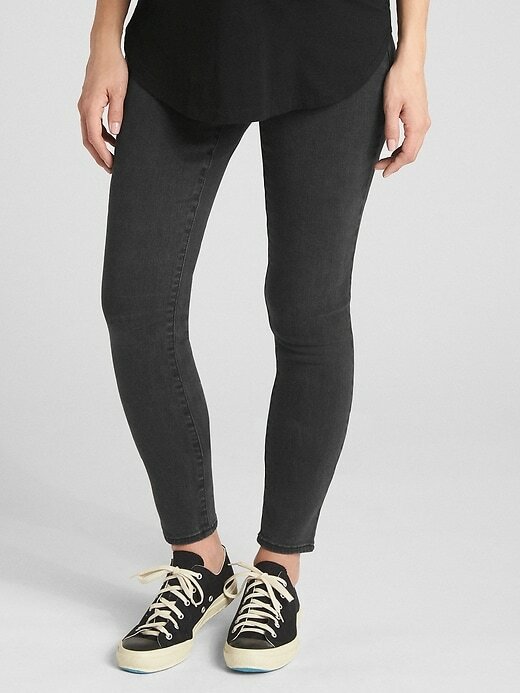 Model is wearing a regular Gap size 27.